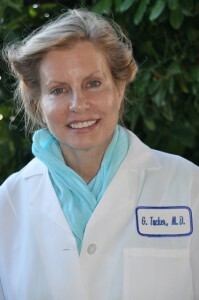 Gloria Tucker, M.D. is a Board Certified Specialist in Sports Medicine who practiced non-surgical Orthopedic Medicine for 13 years at Kaiser. She is a Phi Beta Kappa Honor Student and graduate from USC School of Medicine. She is an instructor of Prolotherapy with the Hackett Hemwall Foundation and has been a musculoskeletal anatomy instructor for many years. Dr. Tucker left conventional medicine at Kaiser in order to follow her passion of providing effective treatment for pain using regenerative medicine. She uses Prolotherapy, PRP and Peri-Neural Injection therapy (Neuro-Prolotherapy). Her practice is almost entirely the treatment of musculoskeletal pain and her patients are very happy with their results (please see the videotestimonials from her website at gloriatuckermd.com). Dr Tucker spends a good part of her vacation every year providing medical care to the indigent in the 3rd world country of Honduras. She is a serious practitioner of meditation and treats her patients with great skill and compassion.